For this first post in 2012, I propose to take you for a ride to Venezuela. What’s better than the sun and heat of the Caribbeans to forget about the rigors of winter in Paris ? Based on Claude Rank’s spy novel, Raoul André’s film MISSION TO CARACAS is produced by Robert de Nesle(1). 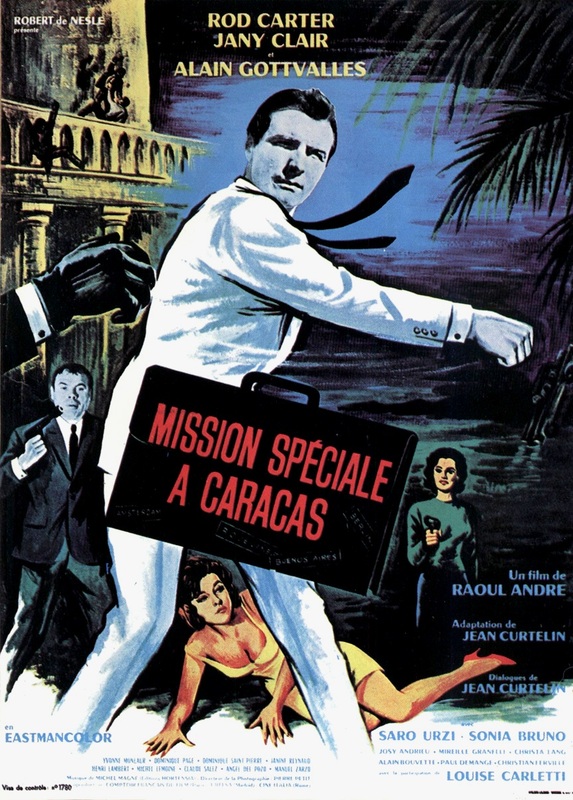 In the same popular vein as OSS 117, Le Gorille, Le Tigre or Coplan, MISSION takes the audience through the hectic tribulations of special services agent Gil Becker, who is searching for the plans of a secret weapon, hidden in a briefcase coveted by many smugglers. I can’t resist the urge to offer you the synopsis as it was published in the press book at the time of its release. The "Antilles", a great white cruise ship, prepares to sail from La Guairá, Venezuela, to Le Havre. Aboard the ship is Emile Vasson (Saro Urzi), a notorious arms dealer who intends to retire from business after making a fortune : he has indeed sold to a group of South American revolutionaries the secret of the Sarin bomb, a paralyzing gas which has the property to kill its victims instantly. An experiment has even been conducted positively on a column of the Venezuelan army with stunning results. Vasson is charged by the organization that has acquired the rights to the bomb’s secrets to bring it to Europe in order to have it manufactured. A rival gang, represented by Loys (Michel Lemoine) and two killers, Karl (Henri Lambert) and Frantz (Claude Salez), has decided to grab the briefcase containing the documents and precious stones, all of Vasson’s fortune. Fearing the worst, Vasson has entrusted the briefcase with Martine De Lainville (Louise Carletti) and ordered her to take it aboard the ship. 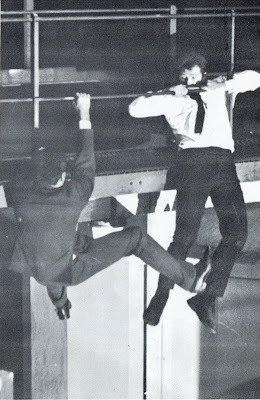 Upon arriving on the bridge, passing by Martine, he seizes the briefcase but Loys uses against him a silent weapon hidden in a small camera. In a coma, Vasson is transported to the ship’s infirmary and dies, leaving the precious briefcase in the hands of Martine De Lainville. But she is not alone in the infirmary. Other people have witnessed the scene and seen the contents of the briefcase. 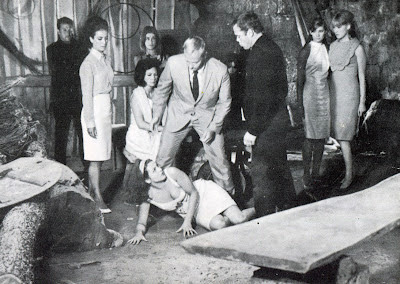 Here are, besides Martine De Lainville, Caroline (Jany Clair), Christel ( Christa Lang), Laura (Sonia Bruno), three models, Lydia (Dominique St Pierre), a nurse, Renée ( Josy Andrieux) a singer, Yannick (Dominique Page), a stewardess, and Muriel (Yvonne Monlaur), Dominique ( Mireille Granelli) et Véronique (Janine Reynaud), childcare nurses. Immediately, each of these girls has an urge to appropriate the briefcase and its contents. Then comes Gil Becker (Rod Carter), a tall and strapping guy, representing the French special services, escorted by the ship’s commissar Breuil ( Alain Gottvalles). These two also want the briefcase, of such an interest to the special services, and make every effort to seize it. The girls fight between them, especially during a stop at Point-à-Pitre, Guadeloupe. They are ready to try everything in order to grab what they rightfully view as a real treasure. A romance develops between Caroline and Gil Becker, and another between Dominique and commissar Breuil, but these love stories develop in a harsh climate, hard and dangerous. One after another , Martine De Lainville, then Loys and Veronique disappear. At the Vigo stopover, in spite of a Homeric battle, during which Breuil will display his swimming talents, no one will be able to seize the briefcase, still hidden on board. MISSION TO CARACAS is probably not a great film. The plot summary above, with its awkwardness and naive narration, sometimes unintentionally funny, reflects the numerous problems which marked its shooting, one of the longest and most chaotic I’ve ever lived. We went on a cruise to Venezuela during the months of april, may and june. It was such a holiday for most of the team that we sometimes forgot we had a movie to shoot ! 1- Producer of the great classic: George Franju’s Judex,and numerous B pictures with various directors, such as Yves Boisset, Riccardo Freda or Jesus Franco.